I left my dinner party in Niagara and began to head south towards Buffalo. I probably had about 2 hours of daylight remaining, but I began my search for a tent spot. In metro areas, this can take some time. Luckily I stumbled on a pretty good spot in just a few minutes. It was in the middle of a commercial block on wooded land that appeared to be unclaimed. Getting Annie hidden and finding a clear spot large enough to accommodate my tent were both challenges, but I eventually solved both issues. I had another cold night. Once again, packing up took around 90 minutes. As I turned Annie’s ignition on, illuminating her taillight, I noticed a woman doing some workouts in the nearby abandoned lot. The light had caused her to gaze suspiciously in my direction. I just yelled out “good morning” and told her what I was doing. She continued with her exercises. I was not entering Buffalo with a great plan. But as usual, I figured that pictures would be easiest at sunrise. I soon found myself driving “over” the city on the Buffalo skyway. I saw some park looking land on the banks of lake Erie so I explored the area. I was surprised how much land was set aside despite being so close to the city. I drove right through a heard of deer that were grazing there. I was hoping to find a good skyline view, but that did not materialize. I hopped back on the skyway and headed into town. My first stoplight in Buffalo was an eventful one, in a good way. The lady next to me engaged me in conversation, talking about travelling. Meanwhile, the person behind me was taking a picture. I really like this one. The McKinley monument is over my left shoulder. Don’t worry, I have a new turn signal waiting in Brooklyn. Thanks, Diana, for sharing this! It’s an angle I don’t get too often. Next stop was the area around where the Erie Canal reaches lake Erie. 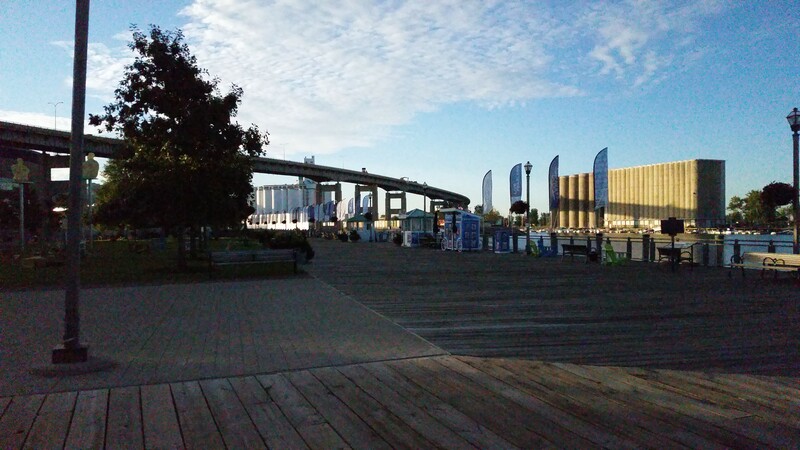 It is called “canalside.” There is a big open area used for events that is very well maintained. 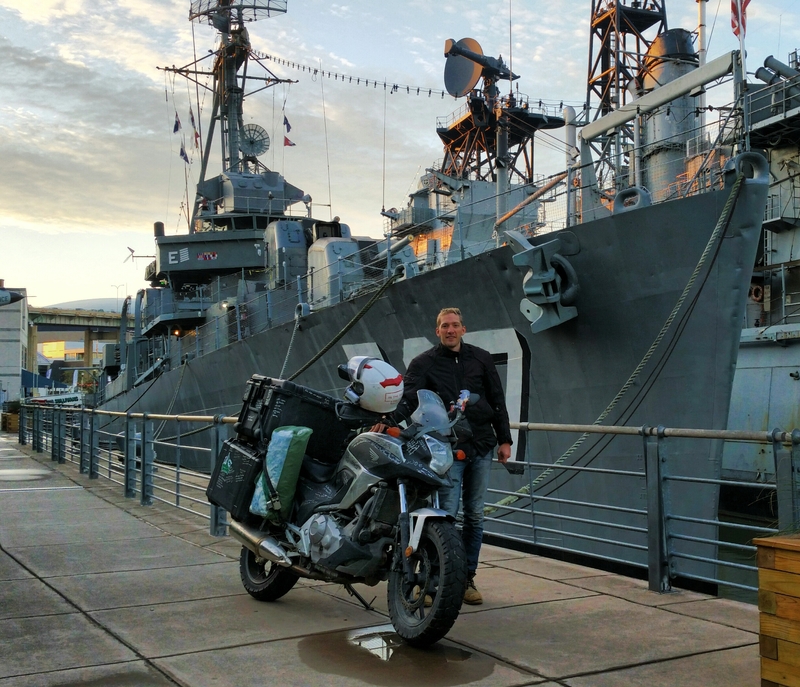 In addition, there is a Naval museum which would be the subject of a few photos. It was still early enough that no one was around. I really like both of these. There were also a number of memorials and tributes to those who have served. It is a really neat area. Buffalo seems to be a place that is forward looking. It was just a dinky little town when the construction of the Erie Canal was in its planning phase. 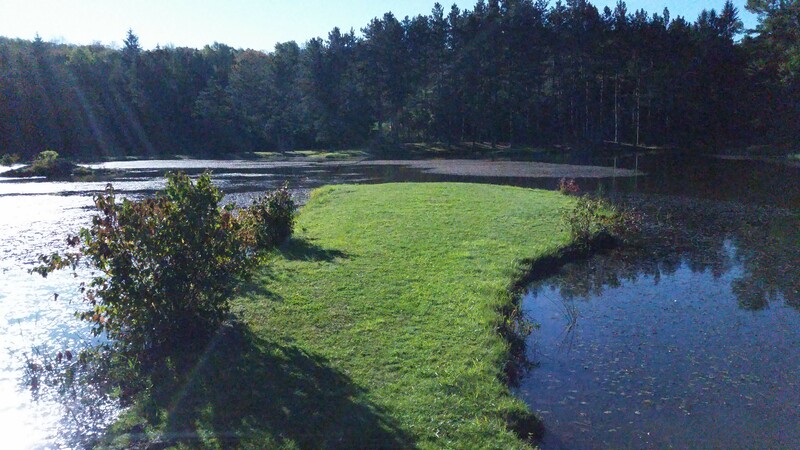 The citizens mounted an extraordinary effort to both make Buffalo Creek navigable and to design a usable harbor on the lake. They ended up being chosen over the rival city of Black Rock (oddly enough a song place, I’m visiting the one in Connecticut). Buffalo grew so much as a result that in now incorporates its old rival. Other evidences of this forward thinking are still evident. The cities transformation of the canal area from industrial center to leisure plaza are impressive. It is really well laid out and inviting. I was the only one there, as it was still early, but I imagine it buzzes with excitement when events are taking place. Next I made a brief library stop while considering my next move. The history museum was closed since it was Monday, which was disappointing. I stopped for some food supplies, then decided to splurge. People from Nebraska to Maine had told me that when I go to Buffalo, I need to get some wings at the Anchor Bar. This is where Buffalo Wings were first invented. 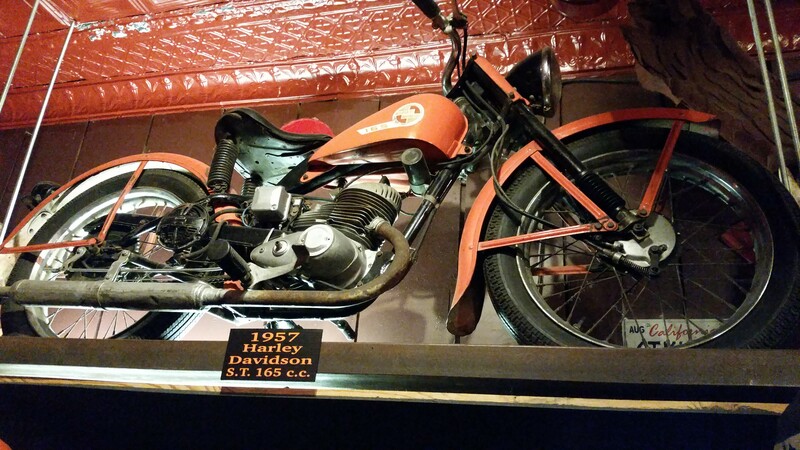 I rode to the restaurant and bellied up to the bar. 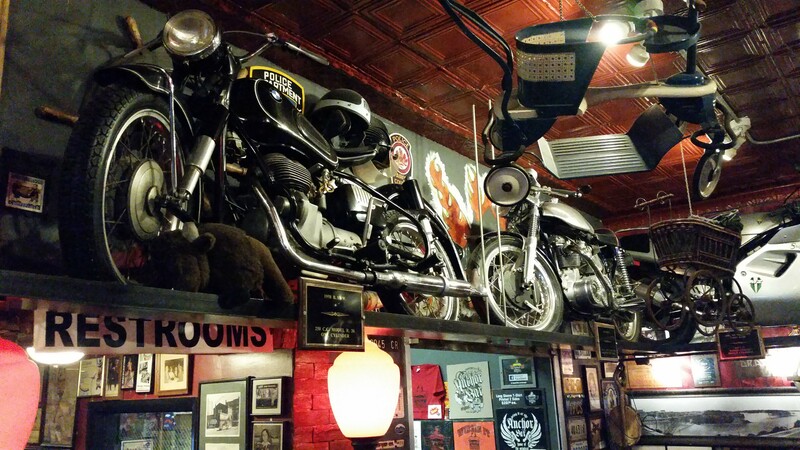 The decorating was interesting, including motorcycles up on the walls. They had handouts explaining the story and Buffalo culture in general. When my wings came, I asked if I could take them outside for a picture with Annie. 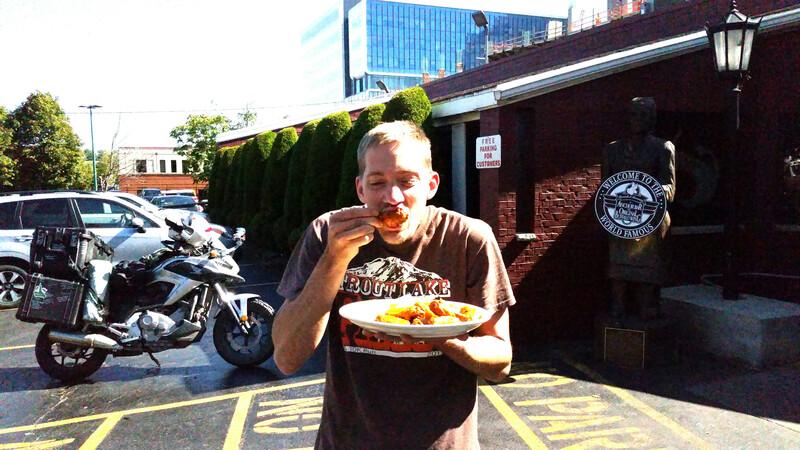 The bartender, Jesse, was a cool guy and I talked to him about Buffalo while I slowly gnawed through my meal. Total damage, including the tip, was $22. A new trip record. My previous food supply stop was $6 for food sufficient to last me three days. I guess that is why I do not eat out very much. It was totally worth the experience though. I have no regrets. I felt like I had done Buffalo pretty well, but decided to make one more stop. When I ask locals what picture would best represent their place, often times a sports stadium is mentioned. I’ve shied away from using these because they are just too easy. 🙂 However, Buffalo and the Bills have a connection which runs deeper than many sports teams. I decided to go to the stadium. I arrived at the gate and just finished asking the security guy about a picture, but he was having none of it. 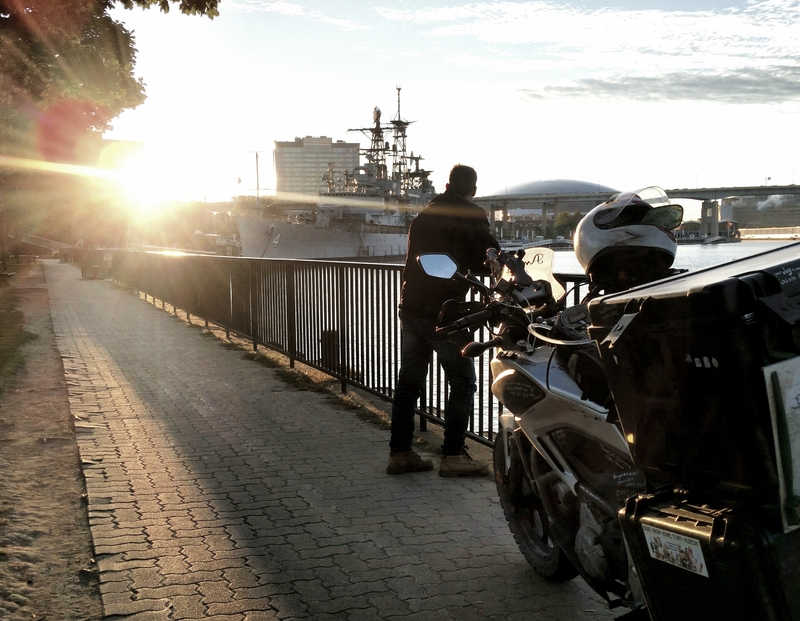 Indeed, the bulk of our conversation consisted about how he wanted me to put my bike into reverse (no, motorcycles don’t have reverse) and back up through the vehicle that was behind me. 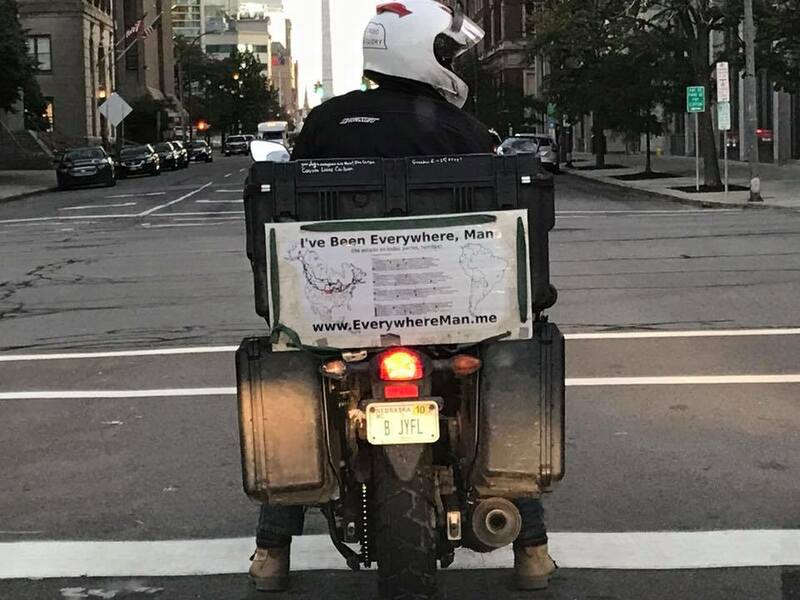 Apparently he believes motorcycles and their operators are superdimensional entities which can pass through physical obstacles without touching them. I eventually convinced him to let me pull forward 5 feet so I could turn around. But have no fear! Even though I was denied access, I still found the perfect photo to represent the Bills franchise. My final interaction notwithstanding, I had a great time in Buffalo. My mom isn’t a coffee drinker, but she calls my Swedish egg coffee the “least worst” coffee. In the same way, I am generally not a fan of big cities, but Buffalo is one of the least worst big cities I have been to. That’s quite a compliment! One of my favorite anecdotes about this place was how it came to be named Buffalo. 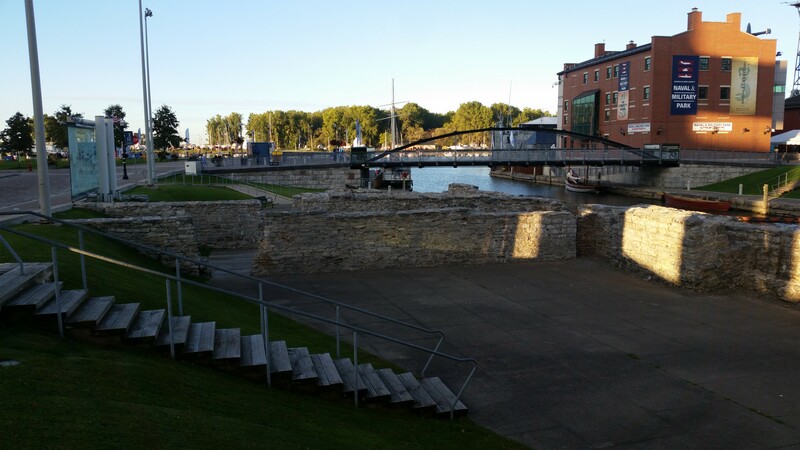 The city of Buffalo took its name from Buffalo Creek. How did that creek get its name? The story goes that French trappers in the area were calling it “beau fleuve” (beautiful river). When English speakers began to use this term, it was eventually anglicized as “Buffalo.” This story might be apocryphal, but I really hope its true. What could be more American than mispronouncing French words? I made some eastern progress before settling down at Palmer’s Pond State Forest. There was a large camping area and I had it all to myself. I found what could be described as the most “Andersonian” campsite possible. (Andersons always set up as close to the water as possible). 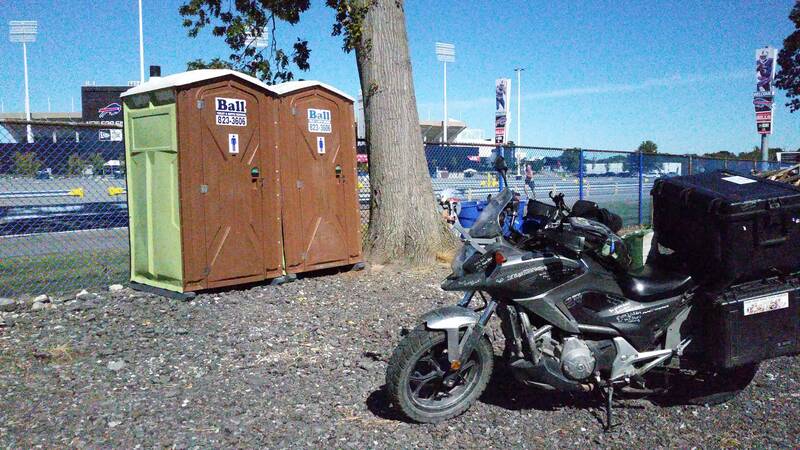 I decided on a more protected spot instead, unsure of what the wind conditions would be. It was such a serene setting. A couple of beavers paddled around. Sometimes they would come close to me before slapping their tails and submerging. I had a great talk with my Grandma, which is always an encouragement. A great, full, grateful day! I was up by 5:30, but I decided to linger in the tent for awhile. Mostly just because I could. I made some coffee and had a bigger breakfast than usual. 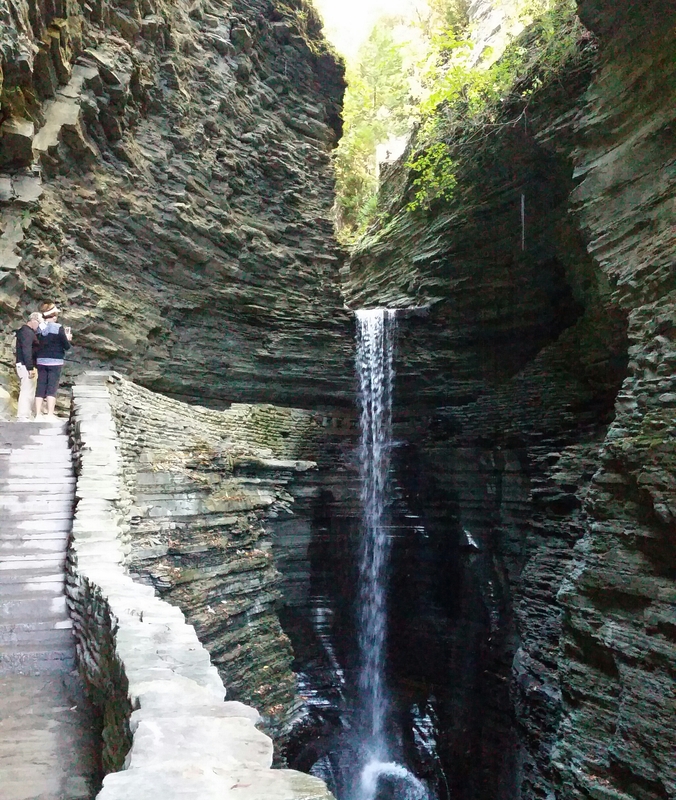 Today would be primarily a travel day, but I had one very important stop: Watkins Glen State Park. 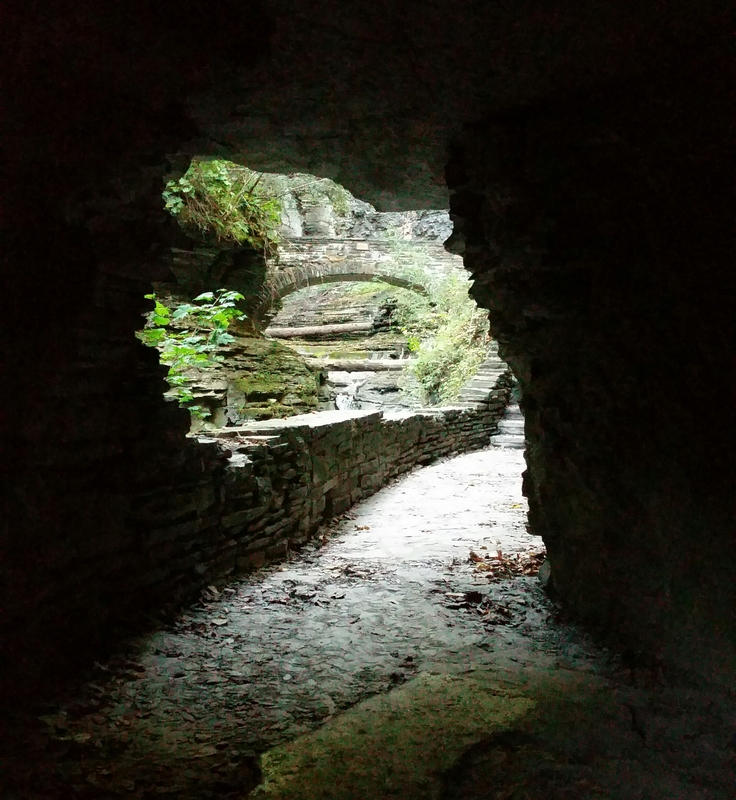 I visited here just briefly during my 2013 trip and was absolutely blown away by the scenery on the Gorge trail. I was in a big hurry that day, so I wanted to take some more time this go around. Farewell peaceful place and beaver buddies! I don’t really know what to say about the Gorge Trail. If you are a person who likes to take pictures, you should probably refrain from visiting. Each step provides a new angle and surprising view, so you may never get out. I actually don’t love these pictures. I could have done better. I continued east and made a wifi stop in Ithaca. 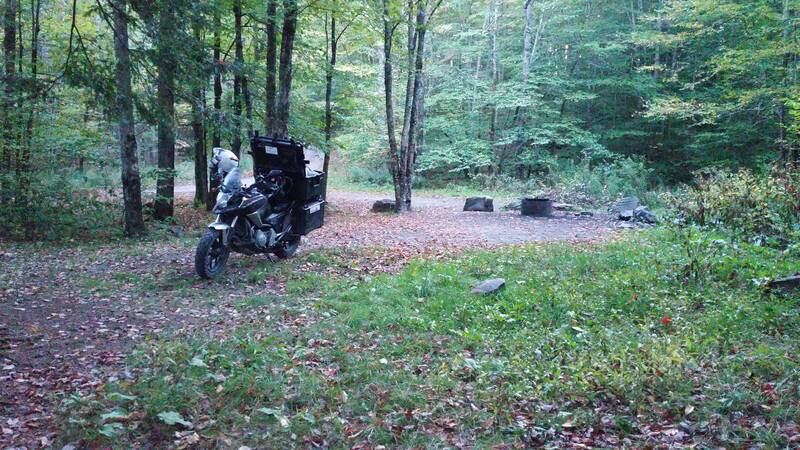 I found a free campsite up in the Catskill Mountains and proceeded that way. This was maybe not the best decision. It was already a little chilly and gaining elevation would make it more so. Still, I had a quiet, uneventful night. Just the kind I like. Buffalo was place 28 of 92. Honestly, it feels like I should be further along than that. Places will come thick and fast as I finish up New England. I’ll rarely have a day when I do not visit a song place. As always, thanks for reading! Realtime update: Sitting in Boston. Will finish up here today. Next will be Black Rock, CT, more of a neighborhood than a city. Then I will continue into the NYC area for Haverstraw and Hackensack. I’m doing well. I’ve had some wonderfully encouraging things happening. Awww….I wish I was there! Tell Gord Happy Birthday from me and all the citizens of Nebraska! 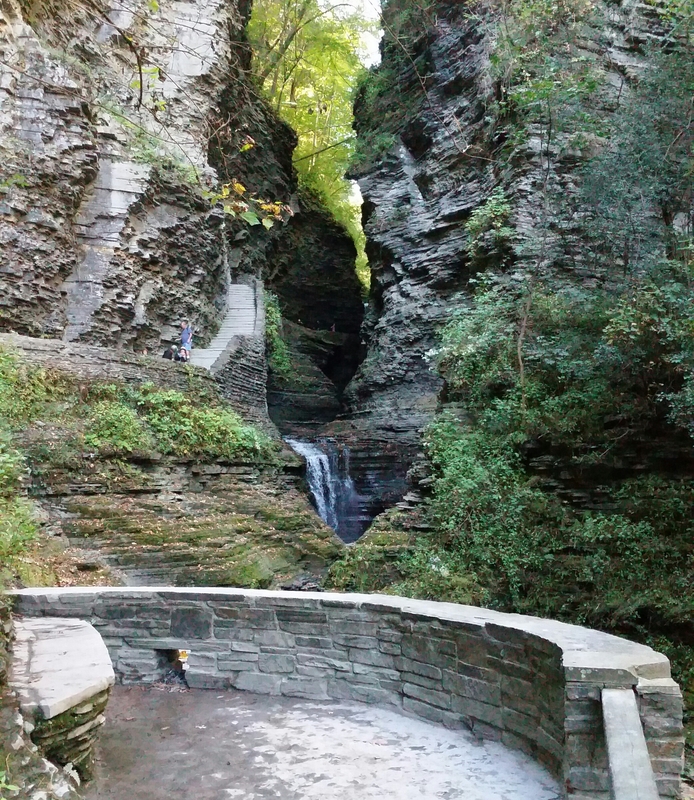 I enjoyed your pictures of Watkins Glen. OK, you got further than we did ha. We started out and could see the falls but decided it would be better to go back while we could both still walk. So enjoying your writing, pictures, and the good people that you meet along the way. Take care. Susie S.
It would probably be worth being life-flighted out in order to see all of it. It is that good! Great to hear from you Susie.